Last night I was lying in bed thinking: how in the world are we going to beat these Chinese gold sellers? Since the advent of MMO’s, gold buying and selling for cash has been a known frivolous activity. It’s even known in popular culture, as seen on Person of Interest. In this post, I’ll be talking specifically about WoW gold selling. You may have the questionably written private messages with links to gold selling sites. You may have seen the full-plaza ads with dead bodies. You may have even purchased gold yourself (shame on you)! Gold farming and selling is a serious business in China. People make a living off of playing World of Warcraft hours on end. According to Nymh’s song, 10 cents an hour is good money when you are Chinese. It may seem harmless, but it has a dire consequences on server economy. These gold sellers keep characters logged off at mining and herb nodes and just log in when the timers are up. They basically have the monopoly on many items and become the kingpins of the market. Prices, in turn, are super-inflated, and many professions become much harder to work with. Not only do these Chinese farm gold, but on vanilla private servers, they also farm honor rank in battlegrounds. They always run in pre-made groups and eventually end up selling their accounts for real money. Finally, the worst part about these gold sellers: they don’t interact with you. They’re like robots, but then again they probably only speak Chinese anyway. First, we must look at how these players connect. Firstly, most of them are in China, because it’s actually legal there. 80% of gold farmers are Chinese, with over 100,000 people there being full-time employees for gold-selling sites (hilarious, right?). So if most of them are in China, we can just ban any Chinese IP addresses. Done. Now we’ve got them all using proxies and VPN’s to get around this. Okay, there’s a way to ban those too. Now they’re gone… but now we have a different kind of problem. Case study: Kronos, a vanilla private server by Twinstar, banned Chinese IP’s as well as all proxies and VPNs. For the next 5 weeks, their servers were DDOS’d nonstop by the Chinese gold farmers, preventing anyone from playing at all. I just find it insane and hilarious at the same time that this happened. We got on the China’s bad side. So to prevent this, we can upgrade our DDOS protection, no? Well this isn’t always an option, especially for projects done completely voluntarily with no cash shop, such as Nostalrius. So this brings us to ways that players can mitigate the gold selling plague. 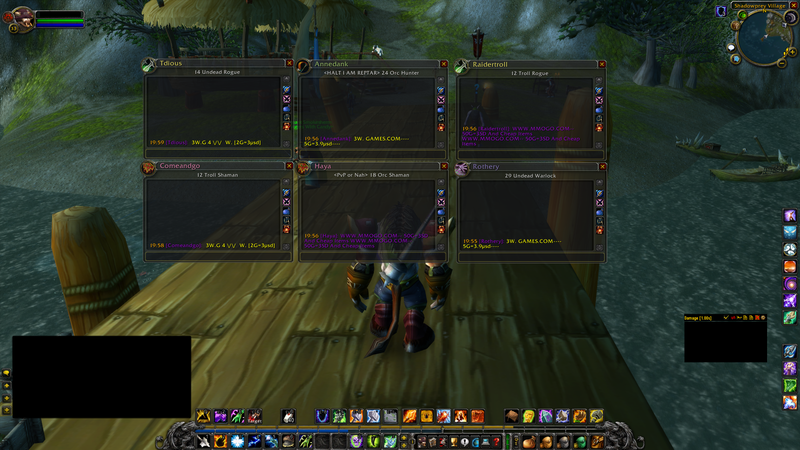 Firstly, the pacifist approach: install an addon that will filter all gold seller private messages and chat invites. This method will basically remove all chat spam, and you will no longer need to ignore every gold seller that messages you. The problem: players that buy gold will still buy gold, and as long as there are buyers, there will be sellers. On the other hand, we can take the aggressive approach: kill the Chinese farmers. If we can slay them before they can ruin the economy as well as camp their bodies, they will realize, using their epic math skills, that playing on the server isn’t worth it. There just won’t be a profit. Unfortunately for PVE servers, this is not a viable option, as you don’t get auto-flagged in contested zones. However, this is, in my opinion, the solution (at least for now) for PVP servers. For already established servers, this technique won’t be as easy. However, for new servers like the Nostalrius fresh realm coming out on January 7th, everyone will start at level 1, meaning if we specifically target the gold farmers early this will impact them the most. So how can you tell if someone is a gold farmer? Usually, they have Chinese-like names, with sounds like Xing, Mei, etc. The most obvious indicator, however, is that they won’t interact with you. Nothing you do will stop them from farming, as they’re on the clock working! So here’s what we got to do: if you see anyone with a Chinese name, or are suspicious of someone being a gold-farmer, just do a simple /wave or /dance. If they reply with a heart hello or something of the nature, they’re clear. It’s the signal. If, however, they fail to reply, don’t hesitate to send them home in an ambulance. If you want to learn more about the Open Season on China, or OSOC movement, check out this video and see some of Itsreal’s other videos.